Pinto beans are climbing beans that can reach heights of between five and six feet, according to "The Allotment Book," by Andi Clevely. Pinto beans are nutritious and high in fiber. They are incredibly easy to grow, but are very susceptible to frost damage, and should not be placed outside unprotected until the chance of frost has passed. 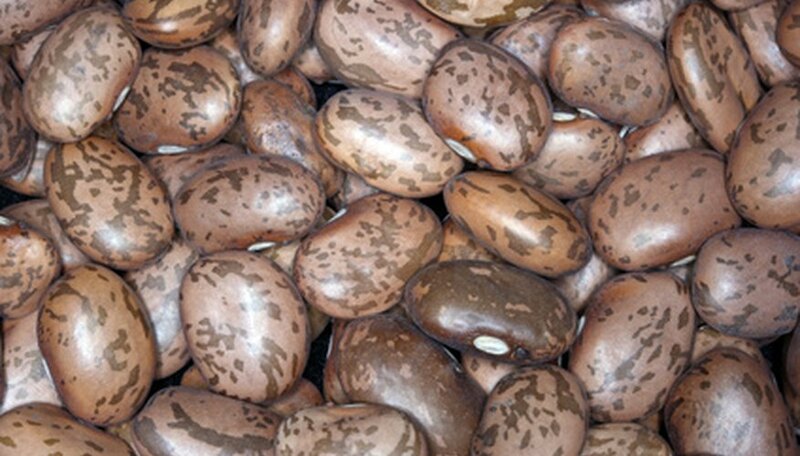 The pinto bean plant's life cycle, from seed to seed, is between 90 to 100. A pinto bean seed consists of two cotyledons, or two halves of the seed under the protective shell, from which the emerging plant takes its nutrients. To achieve the fastest, most reliable germination, dried pinto bean seeds should be soaked in water to rehydrate for up to 24 hours before planting. Plant the seeds at a depth of between one to two inches. The hard, protective shell softens and splits. A root emerges and works its way down into the soil, and a pale green shoot, or hypocotyl, emerges. The hypocotyl should break through the soil in seven to ten days if watered evenly and regularly. As the hypocotyl emerges, it is bent over, and a process known as phototropism begins. According to author Richard Bird, phototropism occurs when the bent stem begins to straighten and grow toward the light. Two small leaves unfurl above the cotyledons, which continue to grow rapidly as the root system begins to develop. The young pinto bean seedlings take nutrients from the cotyledons while their roots are developing. The cotyledons shrivel as the nutrients are used. Pinto beans produce foliage rapidly over the four weeks after germination. Following this spurt of foliage growth, the pinto bean plant begins to flower for 10 to 14 days. The flowers are fertilized and then wither and die, revealing a very small bean pod. Pinto bean pods mature after around 50 days from the time of seeding. The beans can be harvested at this time to eat. If the beans will be stored, then both the bean and the pod must be completely dried before they are removed from the plant, between 70 and 90 days from the time of planting. Pinto beans do not usually cross-pollinate between different varieties, and therefore can be used as seed for the next growing season. After the pods and beans are dried and ready for harvest, keep back some beans, shell them and leave to air dry, then store in a cool, dry environment for next season.